By merging the bathroom cabinet with lighting elements and a mirrored surface, the Schneider approach is one of maximum efficiency of space. 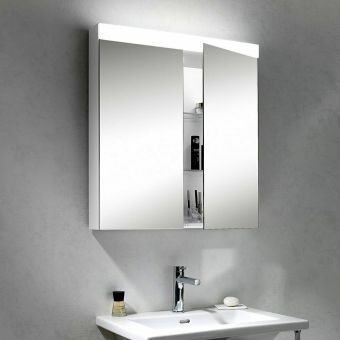 Storage, ambient lighting and the mirror, vital to any bathroom environment, are all presented in one cohesive unit. 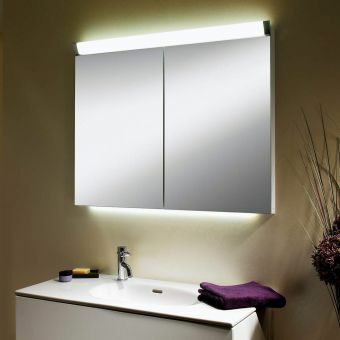 As an alternative lighting source, these mirrors come with either overhead or side mounted elements to give the correct amount and angle of light for your bathroom. With many models mirrored both inside and out, a sheer reflective space is achieved upon opening these units. Founded and based in Germany, Schneider bears all the hallmarks expected of top flight design and production. Using only the highest grade of components, and precisely assembled, these mirror cabinets are a stunning combination of modern materials, form and function. Soft close hinges give a gentle sense of luxury. Fully compliant with IP safety standards, these units are rigorously checked to stand the daily use in the bathroom environment. By using fluorescent strip bulbs, a cool wash of light is given off with a relatively low power consumption. As an alternative lighting source to the standard room lighting, Schneider cabinets are a joy to use at night time to give an ambient glow. Two of the Schneider ranges, GraceLine and MoanaLine, represent their most innovative and popular collections. Employing LED technology for even lower running costs and improved reliability, GraceLine is a sleek and tempered range. Moanaline is a stunning arrangement of aluminium and glass, with options for side or overhead lighting to make it one the most enduringly popular ranges. With over 20 cabinets in the Schneider range stocked by us, you will find that special Schneider cabinet just right for you from this quality Swiss manufacturer where the name of Schneider stands for quality, reliability and a wide range of product. 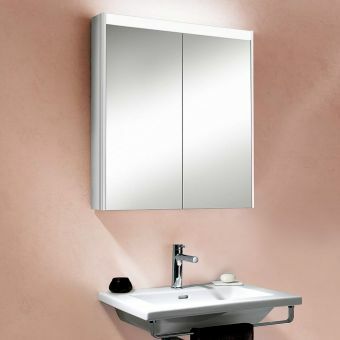 We can guarantee that in the range from Schneider you will find the best in bathroom mirror cabinets which are purpose designed in there shape and user friendliness. All bathroom cabinets have undergone major changes over the past few years and Schneider have been in the forefront of this design change. Storage space, electrical socket and lighting are basic requirements for the modern bathroom cabinet and Schneider is no exception to this. Take a look through our pages and see for your self the sleek clean cut modern lines in the range of Schneider bathroom cabinets where we are confident that you will find the one that is just right for you. Although there are very many illuminated mirrors on the market today, the Schneider mirror is something that will be the envy of your friends and will not become quickly dated. 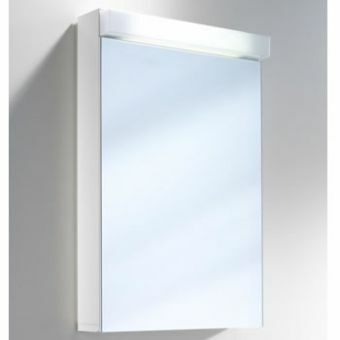 Like all Schneider products, their illuminated mirror has wonderful clean cut lines and you will continue to like it for years to come. The angular appearance of Capeline makes it a sound choice in the bathroom space that takes a strong, modern approach to aesthetics. By adding one of these highly stylish pieces to the bathroom, a central focal point is created. Varying greatly in sizes on offer, these cabinets are a top end, luxury item that fit in perfectly within the context of crisp, contemporary designs. Creating a mirrored surface, these cabinets are available in single, dual or triple door options to fit bathrooms of any size. Ranging from 450mm in width, up to an impressive 1300mm, they can be included in the cloakroom or grand bathroom with ease. Built into the cabinet is an angled lighting strip, it can be tilted up to 38 degrees to give the right level of illumination each time. By combining storage, lighting and a reflective surface in one, Capeline Mirror Cabinets are a design masterclass by Schneider. Created by Schneider for the modern home or living space, the Classicline series has been designed with a crisp, professional look. For the interior that favours a more minimalist approach to both individual items and overall appearance, Classicline has plenty of potential. Available in three different sizes, and with a matching side cabinet, these mirrors provide a cool and vital accessory for the wash space. Lit up with vertical illumination strips, the combination of mirror and lighting makes a natural pairing, with light angled correctly. Adding a cool ambience to the room, it also ensures that all your personal grooming needs are met with the right level of detail. 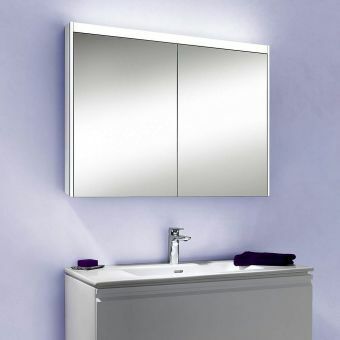 Rated IP44 for safe use in the bathroom area, these mirrors are built to the highest of standards by Schneider. The Classicline Side Cabinet complements any of these mirrors in the series, matching its pared down, sleek look with anodised aluminium and glass, while offering spacious storage options. One of the leading names in bathroom mirror and cabinet craftsmanship, Schneider are renowned for their level of commitment to creating high quality products. Sleek, smooth and eminently modern, Faceline is the go to range for anyone with an eye for modern luxury in the minimalist style. Fitted with either one, two or three doors, Faceline Mirror Cabinets create a sheer reflective surface, with further mirrored surfaces within. Fully adjustable glass shelves allow the user to arrange toiletries and accessories just how you like them, making this a versatile and useful option. Expertly crafted by one of the leaders in cabinet design, these units incorporate fluorescent strip lighting into the body of the cabinet for the right level of illumination each time. Controlled by remote sensors, a simple wave of the hand activates and deactivates the lighting with total ease. Arranged in a trim and presentable finish, these cabinets are a must have for the bathroom with a cosmopolitan, luxury appearance. Crisp, precise and devastatingly simple in overall appearance, Graceline Cabinets are a stunning example of the Schneider approach to modern luxury items. Crafted with millimetre precision, the perfectionism of their craft shines through in an array of mirrored surfaces, aluminium and cool lighting. Available in three different formats of single, dual or triple door styles, these cabinets can be fitted to a bathroom of almost any dimension. Presented in a bold, masculine guise, they are the perfect finishing piece to the wash area. Detail is to be found throughout Graceline, with continuously adjustable glass shelves to be positioned exactly where you need them, while a magnified mirror allows close up detail when needed for shaving or applying cosmetics. Operated by twin pull switches, the integrated lighting gives just the correct level of ambience to complement the reflective surface. Finally, a soft close action ensures that this cabinet retains a sense of quiet luxury upon opening and closing. Creating its stylish appearance through the use of simplicity and the time honoured traditions of form and function, Lowline Cabinets have been created expertly by Schneider. Perfectly suited for inclusion within the living space that sports an urban, cosmopolitan approach, these mirrored cabinets are vital accessory that combine storage, lighting and a useful reflective surface in one. Arranged in different size options with a choice of number of doors and compartments, these cabinets can be added to almost any space. Cloakrooms, en suites and master bathrooms can all benefit from the cool appearance of Lowline, with the option to coordinate from room to room for a fully coherent look. Strip lighting is integrated into the upper edge of the unit, casting a cool ambience downward and illuminating the surroundings to the correct level. Each unit is fully insulated and rated at IP44 for safe use within the bathroom environment. Sleek and stylish, the Moanaline range of bathroom cabinets presents the user with an array of options from which to pick. Ranging in size from 550mm in width to 1000mm, they can be installed in a range of contexts. Presented in a bold and modern guise, Moanaline has been created by Schneider with an emphasis on function of product, realised in contemporary materials and using clean, straight lines. This crisp combination of light, aluminium and mirrored surfaces projects a clean and professional finish, ideal for not just the family home but also the hotel or guesthouse. Moanaline includes its own illumination, with either overhead or side mounted lighting strips. Fluorescent strip bulbs provide an ambient glow, making this a cool, low powered alternative to the main bathroom lighting units. Attention to detail can be found throughout with soft close hinges, and a handy integrated shaver socket for those essential bathroom appliances. Fresh, bold and simple, Pepline cabinets are a real boon to the interior that embraces all things modern and pared down. Fashioned into a simple shape, clean lines and right angles mark out the Pepline as a highly relevant piece to contemporary living spaces. Created by Schneider, the Pepline series uses modern materials and integrates them together seamlessly with strip lighting. Remotely operate, a simple wave of the hand activates or deactivates the lighting elements integrated into the body of this cabinet. Fitted with useful details such as an accessory box for makeup and other toiletries, and an in built shaver socket, this is a true luxury item that has been crafted to the highest of standards. Soft close hinges and fully adjustable glass shelves are included as standard, with the former ensuring a smooth action when opening or closing the reflective doors. As an addition to the wash area, this cabinet is a vital anchor point of the fresh, modern bathroom interior. A daring combination of simple geometry, Prideline is a range with plenty to recommend it. Tailor made for inclusion in the modern living environment. By utilising mirrored surfaces, glass, aluminium and fluorescent lighting, Prideline is a sparse and masculine range well suited to the interior that embraces the cool, minimalist look. Available in variants of single, dual or triple door models, Prideline can be fitted to a range of differently sized interiors. By combining storage with a mirrored surface, these units are a winning exercise in product design that places emphasis on efficiency, form and function in a single unit. Using tubular halogen lamps to cast a cool ambience, the cabinets can also serve as an alternative lighting option within the bathroom. Fitted with adjustable glass shelves, soft close doors and a useful accessory box, these items tick all the boxes when it comes to expert product design. A stunning product fashioned from anodised aluminium and mirrored surfaces, Splashline Cabinets come in a highly presentable form. Fashioned from straight lines and right angles, these pieces come into their own when applied to the modern bathroom that opts for a cool, minimalist look. By integrating storage, lighting and a mirror surface, Schneider deliver a product that is a perfect balance between form and function. Flanked by two separate lighting elements, Splashline cabinets provide their own illumination via halogen lamps, allowing the user to opt for a different ambient lighting source, separate from the main bathroom light. Fitted with adjustable glass shelves, Splashline allows the user to arrange their toiletries and bathroom accessories as they see fit. This model comes without an inner dividing wall, giving plenty of unbroken space within. Finished with soft close hinges, these cabinets have the true look, feel and sound of genuine luxury items built to the most rigorous of standards. Sheer and sleek, the Schneider Triline mirrors are a must have accessory for the urban, cosmopolitan interior space. Presented in two forms, these mirrors have a strong vertical aspect, making them a fine addition to the interior with bold geometry and strong, clean features. 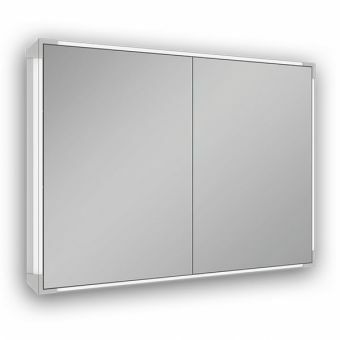 Created to the most rigorous of standards by leaders in the field of mirror and cabinet manufacture, Schneider have delivered mirrors with a purity of form and function. 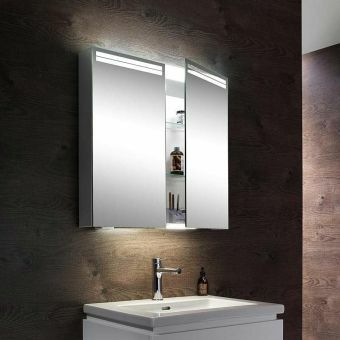 Two options are on offer, with lighting panels integrated into the surface of the mirror for a sleek, unbroken effect, or in a more traditional guise flanking the main body of the mirror. Operated via remote sensor, Triline mirrors respond to a wave of the hand beneath the main body of the unit for maximum ease of use. Added to the bathroom wall, these tall mirrors allow for a full length view, making them an essential item for anyone who wishes to look their best. Created by the leading experts in mirror and cabinet unit design and manufacturing, Wangaline pieces are a sound inclusion in the modern living space. By using mirrored surfaces, glass, aluminium and integrated halogen lighting, Schneider have delivered a classic of modern design. Sparse in form, Wangaline uses simple right angles and clean lines to create iconic mirrored cabinets that are fresh, clean and inspiring. Mounted with their own overhead illumination, these cabinets range is size from a modest 500mm in width, to the broad and spectacular 1500mm wide, three door option. With such sizes available, these cabinets can be applied in a range of contexts from smaller en suite bathrooms, to the focal point of the main bathroom area. 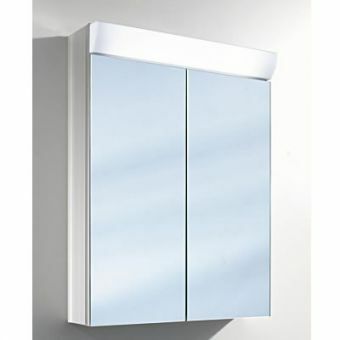 Further to the range of illuminated mirror cabinets is the Wangaline Tall Cabinet. Formed from a cool array of aluminium and glass, it provides ample storage space within the context of a strong, vertical wall mounted unit.